USS Yorktown (CV-5) is hit on the port side, amidships, by a Japanese Type 91 aerial torpedo for the second time by planes from the carrier Hiryu. At about 1400 on June 4, 1942, soon after Yorktown began to move again following bomb damage repairs, her radar detected a second incoming raid from the Japanese carrier Hiryu. This formation included ten B5N2 (Allied code name "Kate") torpedo planes commanded by Lieutenant Joichi Tomonaga (January 9, 1911 - June 4, 1942), plus six escorting A6M2 Zero-Sen (Allied code name "Zeke") fighters. As they approached, Yorktown steadily increased her speed to about twenty knots and launched additional Grumman F4F-4 Wildcats, some with very little fuel. 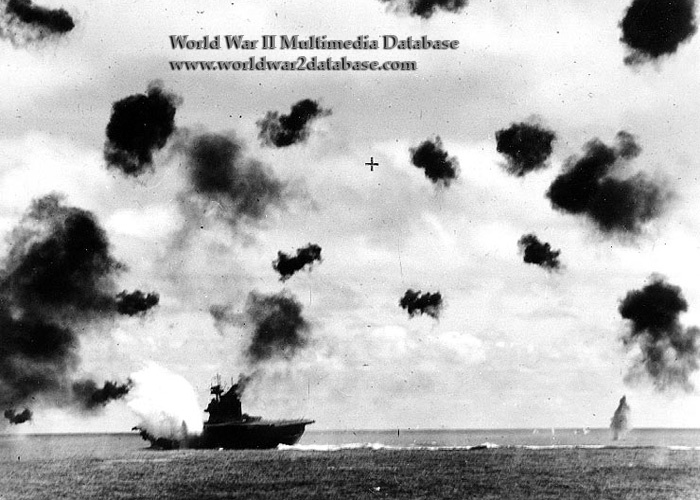 Despite losses to the defending fighters and heavy anti-aircraft fire, the Japanese planes pushed on to deliver a beautifully coordinated torpedo attack. The two warheads opened a very large hole, flooding machinery spaces and other compartments. Her propulsion knocked out once again, Yorktown coasted to a stop and began to list dangerously. Photographed from USS Pensacola (CA-24). Tomonaga was shot down, probably by Lieutenant Commander John S. Thach of Yorktown's Fighting Squadron 3 (VF-3).